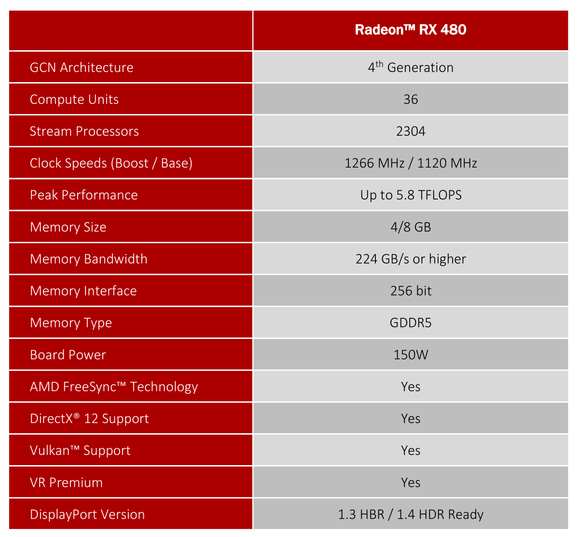 The question’s been reverberating throughout Internet forums and various subreddits since the launch of AMD’s revolutionary US$200 Radeon RX 480 graphics card. 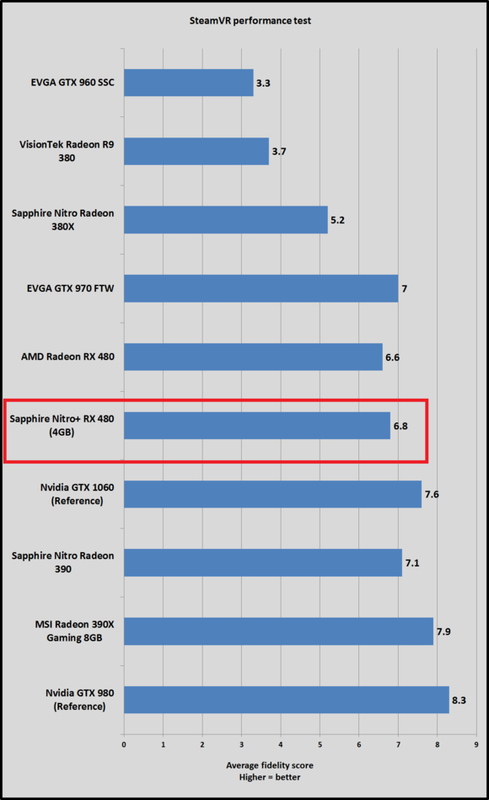 The chorus grew after weeks of radio silence on AMD’s part; amplified when Asus revealed its Strix RX 480 wouldn’t be available until mid-August; and downright exploded into a cacophony when Nvidia’s US$250 GeForce GTX 1060 launched with a full complement of custom designs. Where are the custom cards? 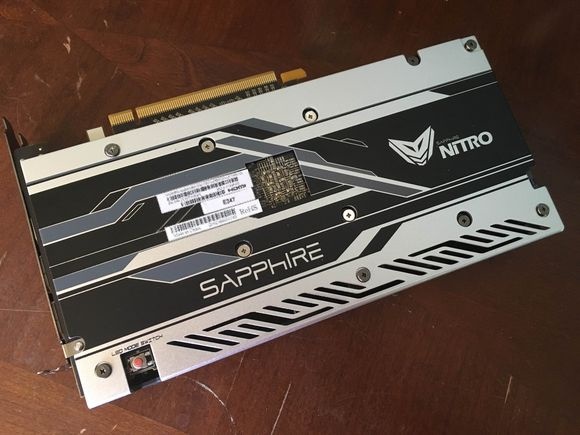 Well, here’s a custom RX 480 card that AMD aficionados have been drooling for: Sapphire’s Nitro+ RX 480. It’s hitting online stores next week on an unspecified date at US$219 for a 4GB model (which we tested) and US$269 for an 8GB version. Flipping on Boost mode also increases the power limit for the card, which is necessary as Polaris’ performance ties heavily into the amount of power it’s being fed. 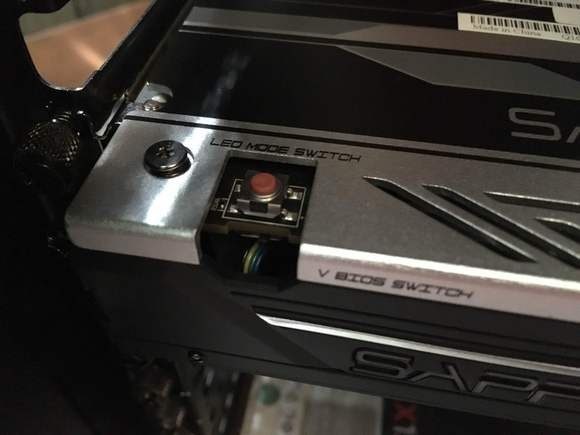 Don’t fret about whether potential power consumption issues will fry your motherboard, though. 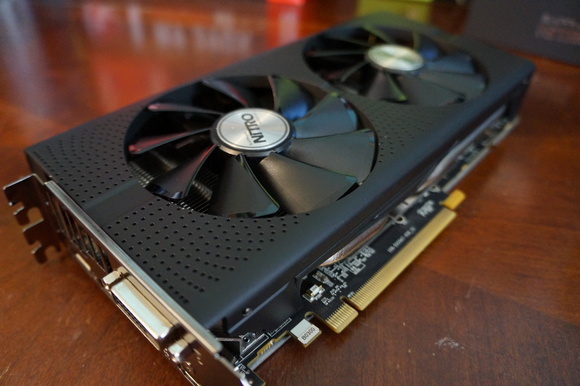 First off, AMD's already released a driver that fixed the reference RX 480’s excessive PCI-E power draw while simultaneously boosting performance. 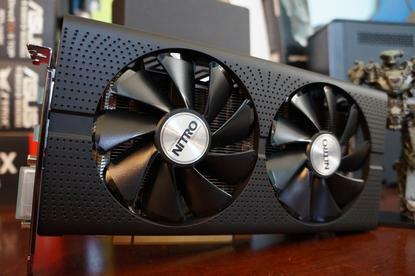 We’re comparing the $220 Nitro+ RX 480 (4GB) against AMD’s reference $240 RX 480, Nvidia’s $300 GeForce GTX 1060 Founders Edition (which essentially performs on par with a $250 GTX 1060 reference card), and the same rivals we used in our reviews of those two cards. 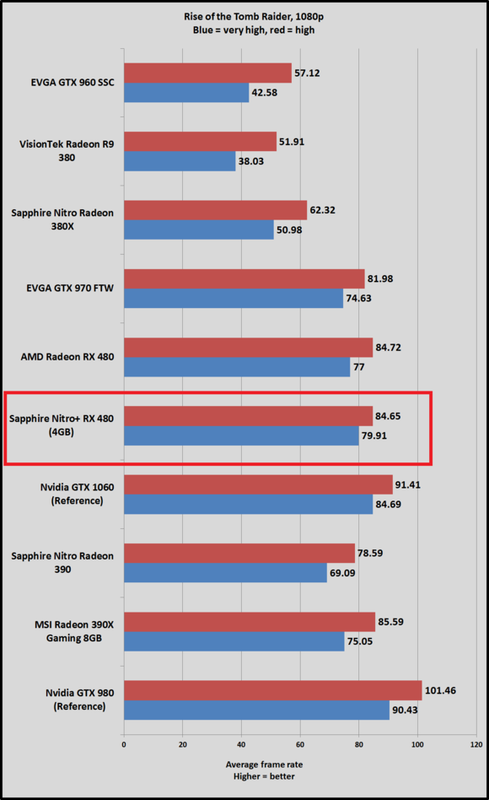 EVGA’s GTX 960 SSC, VisionTek’s Radeon R9 380, and Sapphire’s Radeon R9 380X represent the last-gen crop of $200-ish graphics cards. They don’t hold a candle to the new generation. 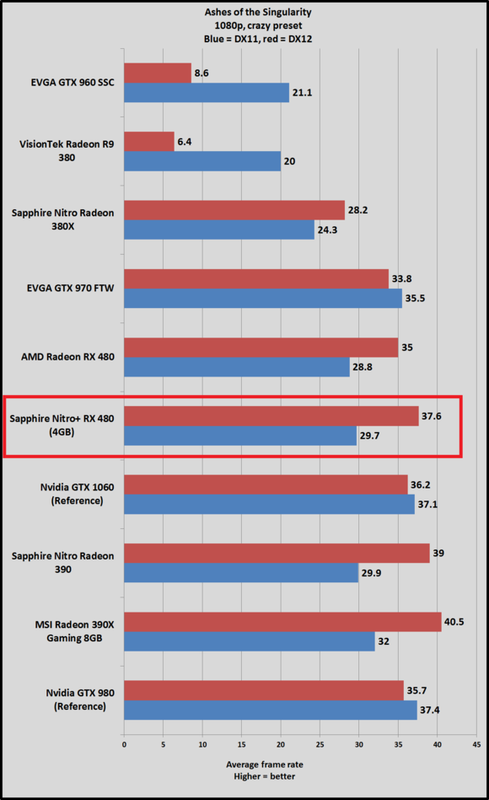 You’ll also find results for more potent options that the GTX 1060 more directly compares to: the Sapphire Nitro R9 390, EVGA GTX 970 FTW, MSI Radeon 390X Gaming 8GB, and the reference Nvidia GTX 980. 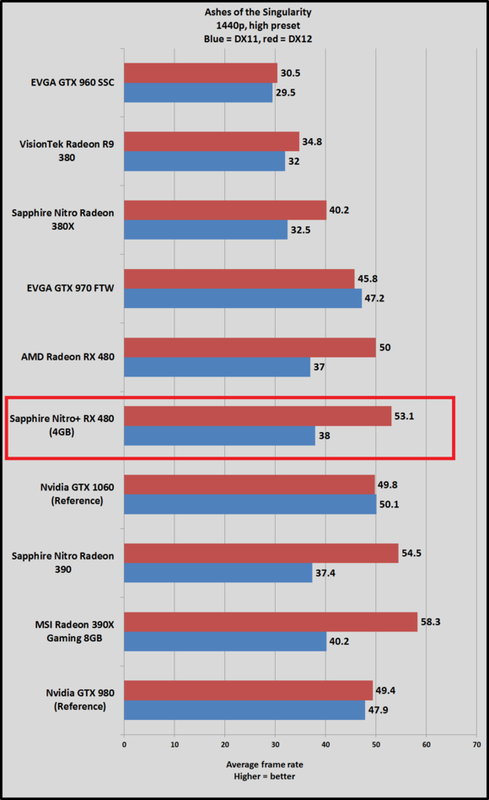 We benchmark every game using the default graphics settings unless otherwise noted, with all vendor-specific special features—such as Nvidia’s GameWorks effects, AMD’s TressFX, and FreeSync/G-Sync—disabled. 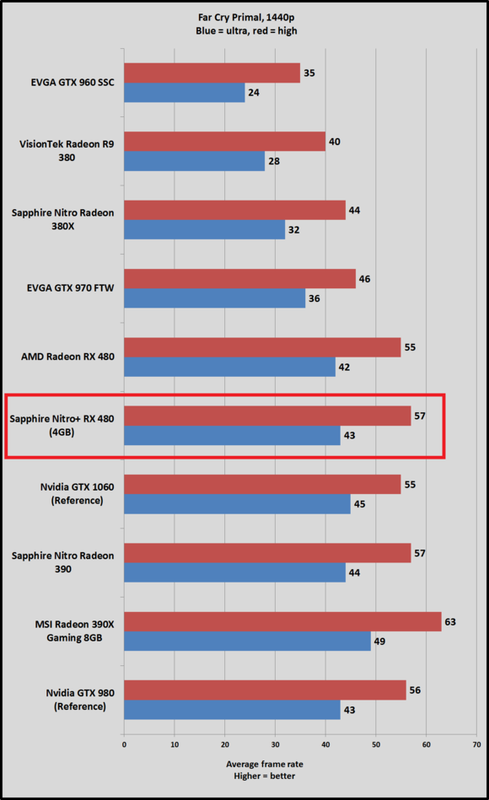 These cards can’t really deliver a compelling 4K gaming experience, so we limited our testing to 1080p and 1440p resolutions. 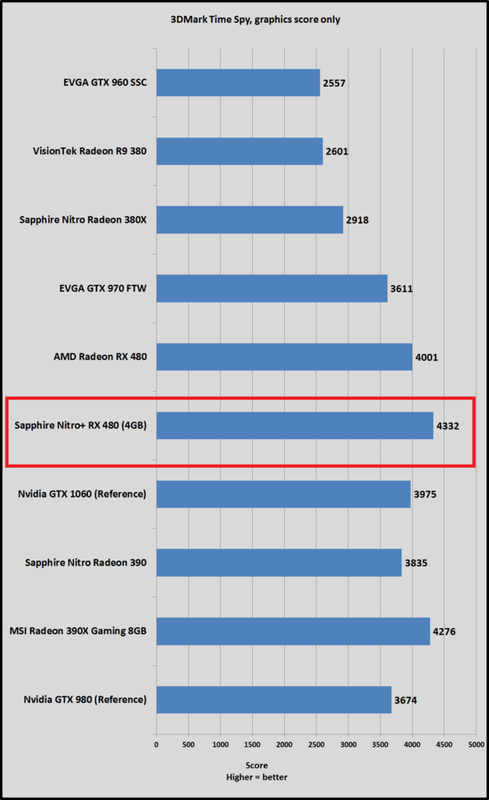 Sapphire sent us a review sample very shortly before launch, so all tests were performed using the default 1306MHz “Boost” BIOS. 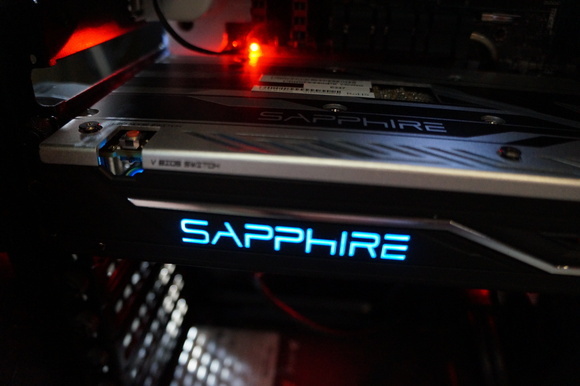 I’m hoping to test the card in quiet mode as well as push the overclock further later today. I’ll update the article to include the results as soon as I do. But enough jibber-jabber! 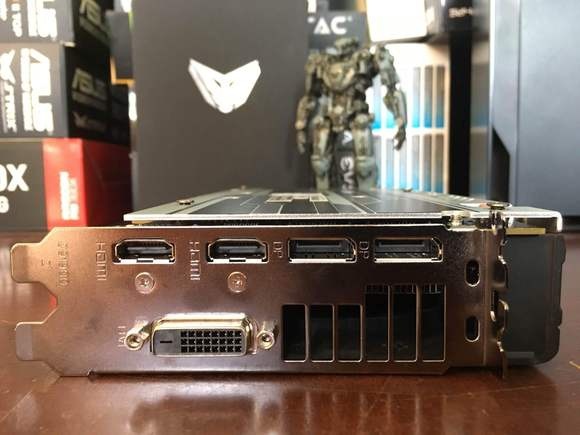 Let’s see what an overclocked, custom-cooled RX 480 is capable of. 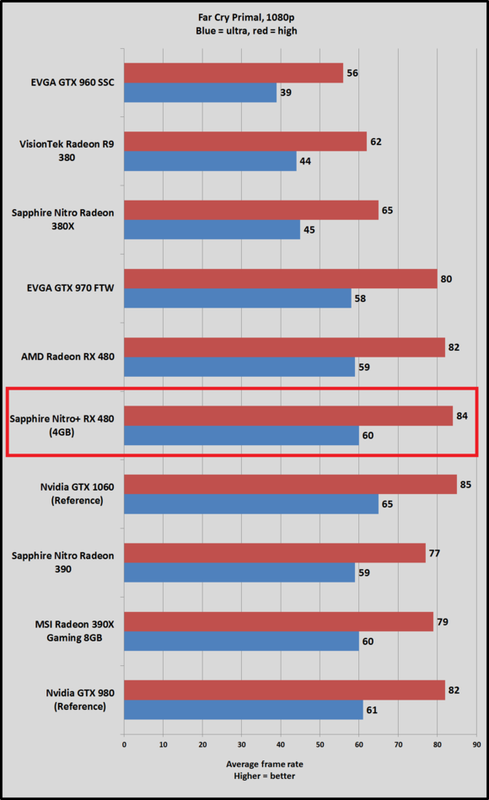 Here, we see the start of a trend we’ll witness throughout the Nitro+ RX 480’s review. 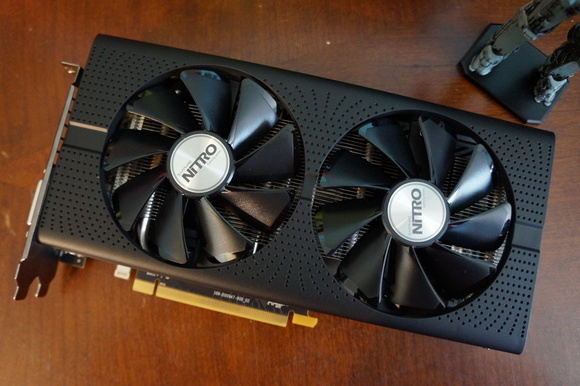 The card’s mild overclock doesn’t push it much higher than the frame rates pumped out by the reference RX 480, but it does enough to bring the AMD-powered card into parity with Nvidia’s more costly GTX 1060 Founders Edition. 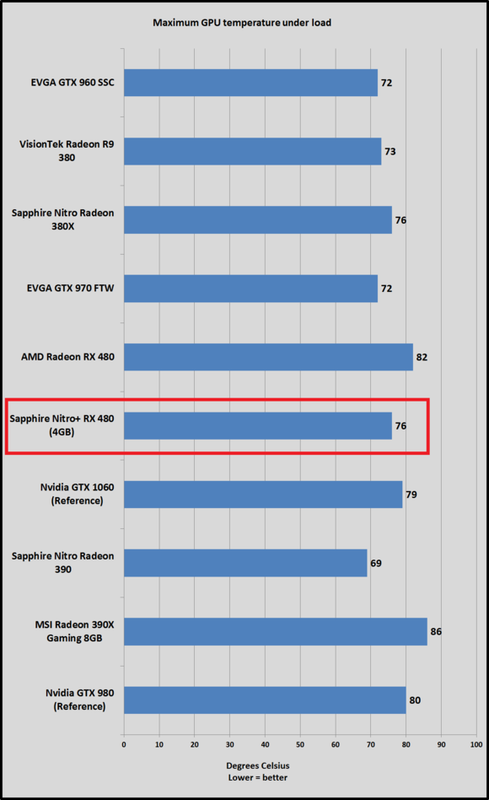 Important note: Hitman automatically caps the game’s Texture Quality, Shadow Maps, and Shadow Resolution at medium on cards with 2GB of onboard memory, meaning the EVGA GTX 970 FTW and VisionTek R9 380 were tested at lower graphical settings. 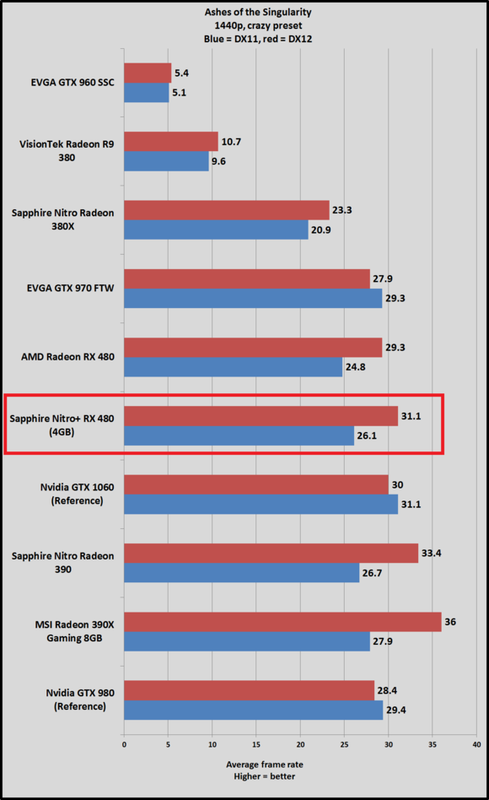 I’ve still included them in the graphs below for two reasons: 1) because they’re the $200 cards the GTX 1060 and RX 480 are directly replacing, and 2) so you can see the comparative DX11 vs. DX12 performance on those cards. 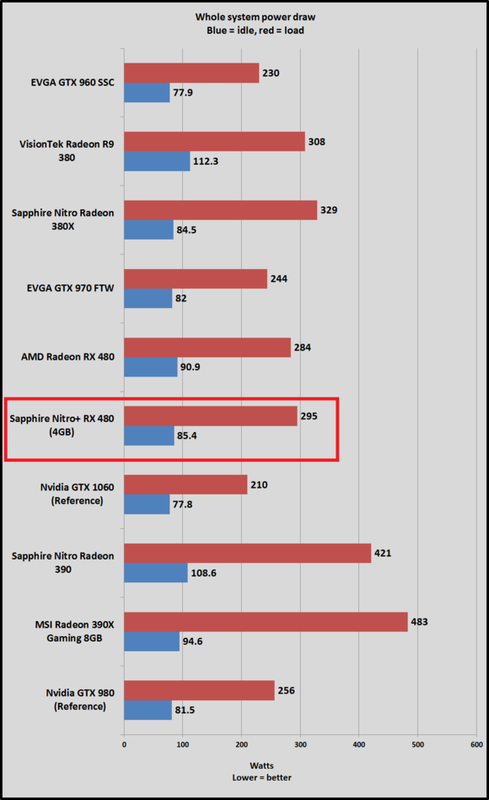 Nvidia’s new Pascal GPU performs far better in Hitman than the older Maxwell-based graphics cards, but again, this game is built for Radeon. 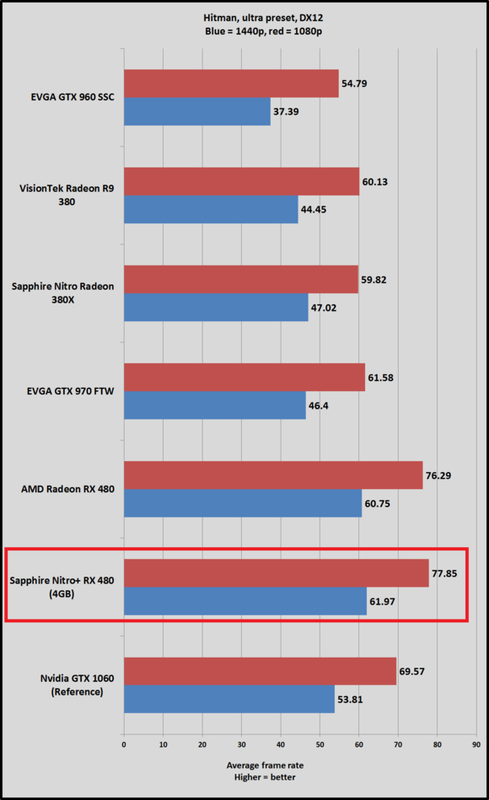 The Nitro+ RX 480’s slight overclock only helps to widen the advantage between it and Nvidia’s GTX 1060. Time for some synthetic benchmarks! First up: The SteamVR performance test, which serves as the only major virtual reality standard until more benchmarking tools hit the streets. 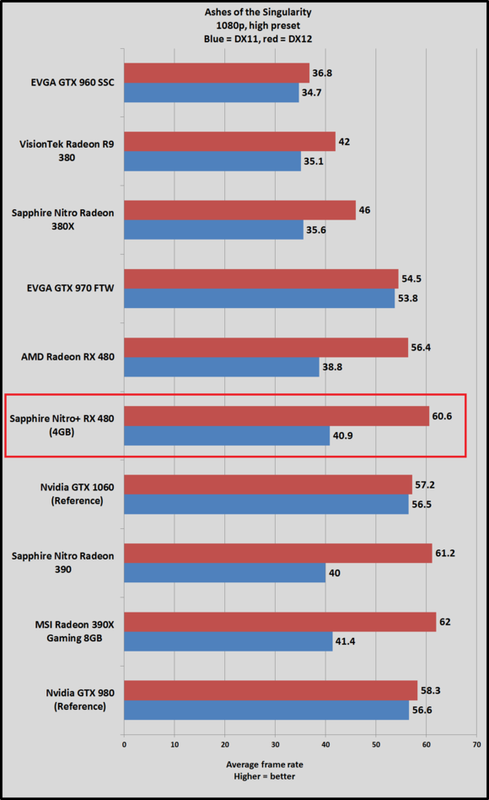 The SteamVR performance test is better thought of as a gauge for your graphics card’s relative virtual reality performance—and as a pass/fail test for determining whether your rig can handle VR whatsoever—than it is for making head-to-head GPU comparisons. 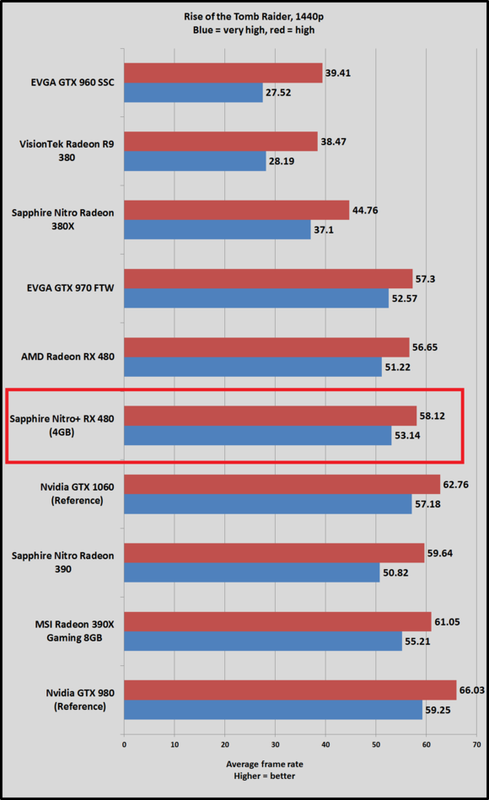 The Nitro+ RX 480 clocks in with a higher average fidelity rating than the reference RX 480 and is definitely VR-ready, although it doesn’t score quite as high as the pricier GTX 1060. 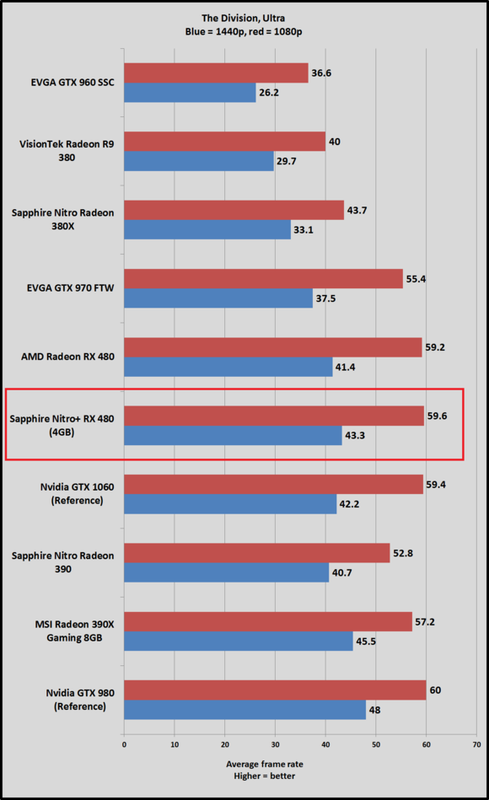 That’s not a big surprise, though, as Nvidia’s cards score consistently higher across the board in the SteamVR performance test than AMD hardware does. 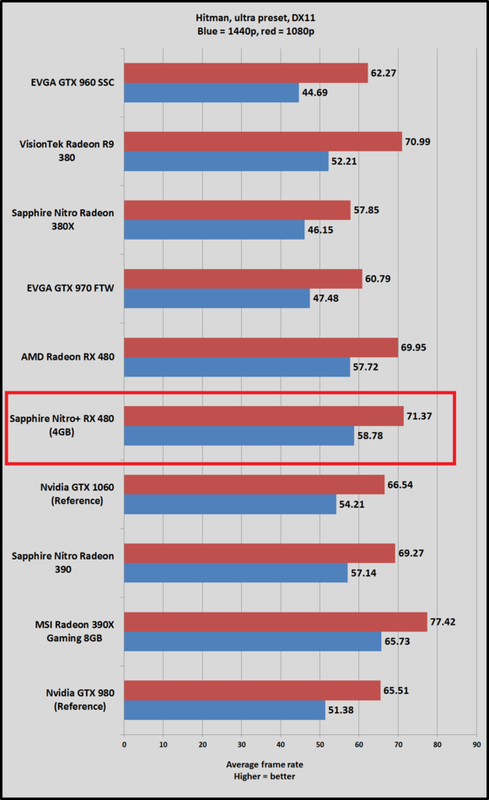 We also tested the GTX 1060 and its rivals using 3DMark’s highly respected DX11 Fire Strike synthetic benchmark, which runs at 1080p, as well as its brand-new Time Spy benchmark, which tests DirectX 12 performance at 2560x1440 resolution. 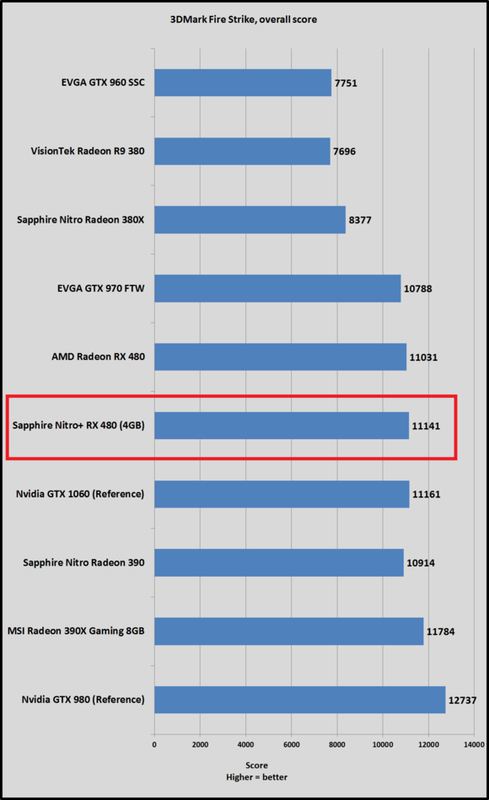 Sapphire’s Nitro+ RX 480 gets a healthy boost thanks to its mild overclock, bringing the card within spitting range of the GTX 1060 in Fire Strike and far surpassing both the GTX 1060 and the stock RX 480 in Time Spy.